I hope you didn't get tricked on April Fool's Day this past weekend. I literally don't trust anyone on April Fool's simply because back in the day, I used to play tricks on people all the time. Which, it's actually crazy that people used to believe me because I'm a horrible liar. I always laugh and give myself away! The last time I did an April Fool's joke, I almost made my Mom and aunts cry so I haven't done any since then HAHA! Anyway, let's talk a little bit about wearing the "little black dress" in the spring! I always say that every woman should have at least one LBD in her closet because you never know when you'll need it for a cocktail party, bachelorette party, wedding, funeral, etc. I have more black dresses than I can count, but that's because I'm crazy and I shop too much! Black dresses are so versatile because you really can do whatever you want with your shoes and accessories to give it a different overall look. Also, they are really good to have for that "I have nothing to wear" night and you've already had all your friends waiting forever, so you just need to put on something cute and go! A simple black dress with popping accessories and some bomb shoes will have you put together in no time! Now, like I said before, I do own quite a few black dresses, but when I saw this LBD, I knew I had to have it. I mean seriously guys, it is SO different with the cut outs in the back! It was screaming "JAMARIA! YOU NEED ME!" as I scrolled past it a few times on tobi.com, which is why I found my way back to it and got it in my possession! :) Y'all know I love a good 'party in the back' outfit and having that in 'LBD' fashion just makes me almost jump for joy. 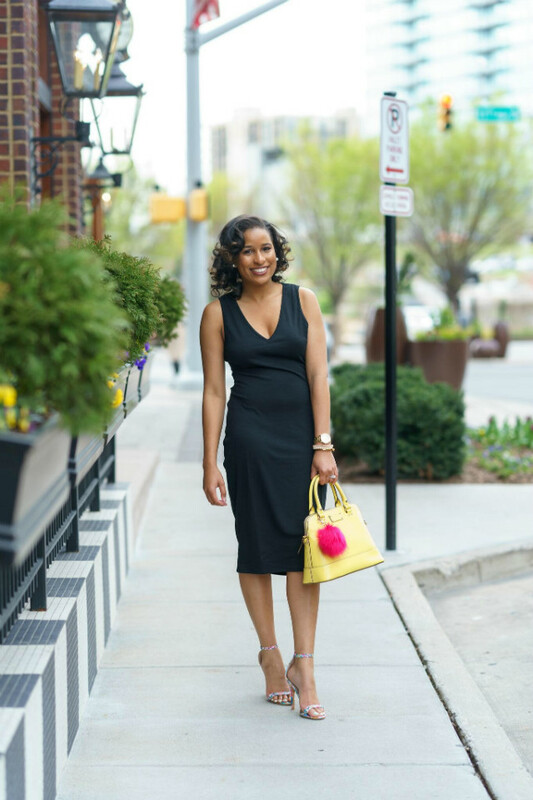 I ended up styling it with my colorful heels and my favorite yellow Kate Spade purse to give it a pop of color for spring and I was ready to go. Yes, ladies you can rock a black dress in the spring/summer months. Just make sure to have fun with your accessories and you will be fine! I hope you had enjoyed your weekend! Saturday was surprisingly chilly here in Nashville, but yesterday was HOT! I hope I don't get sick with all of this back and forth weather we have going on.